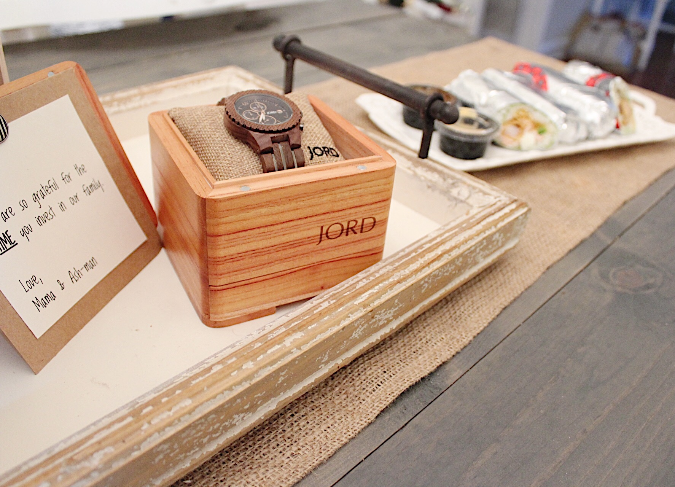 This post was written in exchange for a wood watch from JORD; however, all opinions are my own. My husband works hard. He is our provider. He is an incredible father and shoulder to lean on. He is hands down Asher and my best friend and our number one cheerleader. 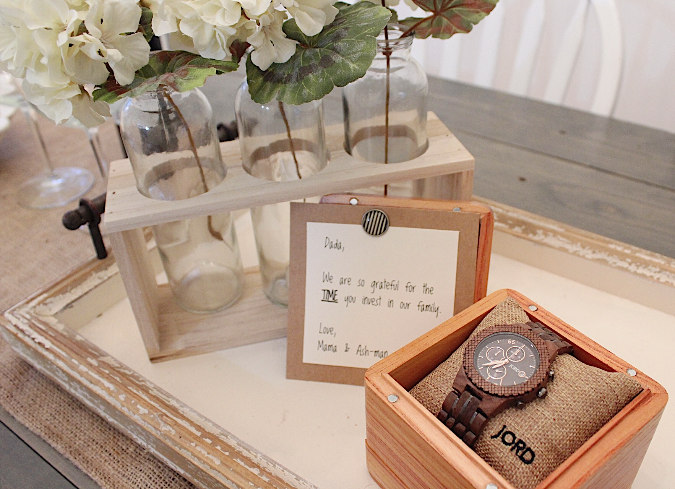 Thus, when JORD reached out to me about a potential collaboration opportunity with their unique men's wood watch line, I could not have been more thrilled as I knew just the man who would love this well deserved gift. 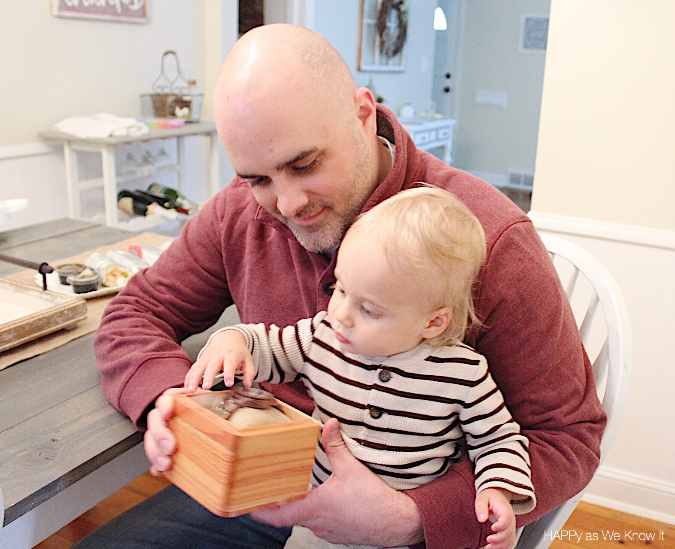 When "Dada's" cool new watch arrived (in the most beautiful packaging may I add), little man and I set to work putting together a little "thank you" dinner to share with our favorite guy. 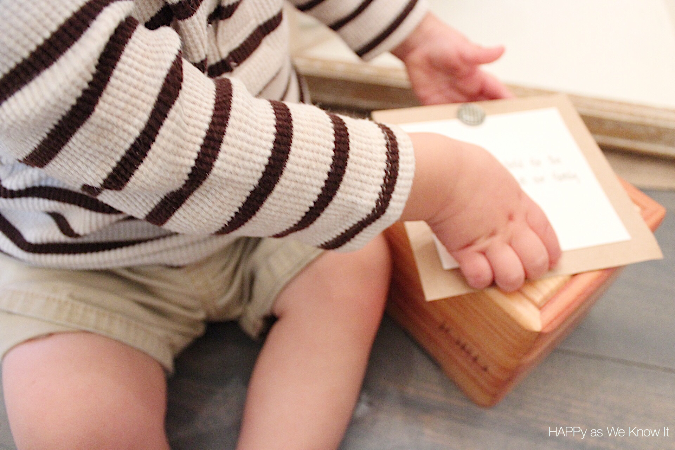 I typed up a short and sweet gift-themed note from Asher and I to set alongside the new wood wrist bling that read "We are so grateful for the TIME you invest in our family". Then I went about ordering Ryan's favorite take out and set it out with a bottle of red wine to finish it off. Then it was time for the little guy and I to eagerly await his arrival home from work. Needless to say, I think our main squeeze was pleasantly surprised. And it felt so good to give back to a man who gives so much to our family day-in and day-out. "Dada" even let Asher try the watch on (and I must admit we are grateful for the microfiber cloth that came with it to wipe off all of those tiny fingerprints). Who knows, maybe someday it is a piece that Ryan can even pass on to our little guy who is so blessed to learn about love and life from this incredible man of ours. Interested in hosting a little "thank you" dinner of your own for your favorite guy? I've teamed up with JORD for a giveaway in which one lucky follower can earn a $100 E Gift Code toward the watch of your choice. Not only that, but all entrants will automatically receive a $25 E Gift Code as well. So really - everyone's a winner! I absolutely love the way the Conway Walnut & Jet Black watch looks on my man's arm. 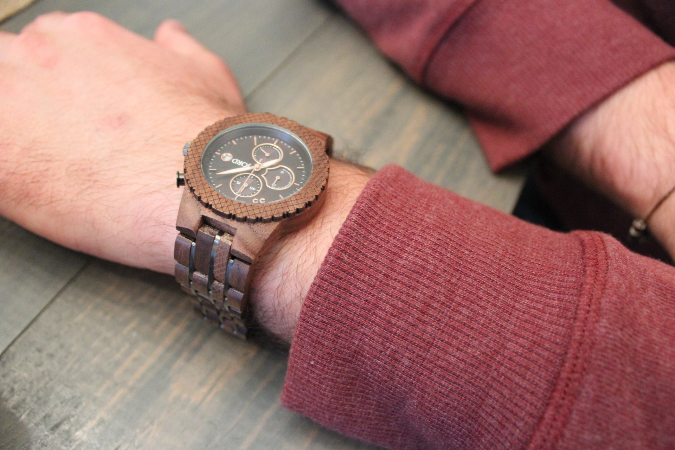 That being said, there is such a wide variety of wooden watch options to choose from to suit any man's style. So are you ready to put an extra wide smile on that special guy's face? Enter the giveaway by clicking on the link below. The giveaway will close on October 15th at 11:59pm. All gift codes must be redeemed by December 31st, 2017. Good luck!